I think making these buns might have been the biggest mistake of my life. They’re just too dang good and I crave them constantly. The first batch quickly dwindled to nothing – I sent a bun or two off to my family and to Mike’s parents and sent a half-dozen off with Mike. I was left staring at four buns. I tried to make them last as long as possible, but I have to be honest… they lasted four days. Maybe less. I think these buns might be the first thing I will ever put on my monthly “must make” list. I rarely make repeat dishes. It takes a good dish to warrant a second visit into my kitchen more than once a year. It takes a stellar dish to make a visit a few times a year. A dish that I want to make every month? Unheard of, until now. I just can’t explain why I loved these buns so much. It’s a combination of the slightly sweet, mostly salty filling surrounded by an impossibly soft, fluffy, yet chewy bun. 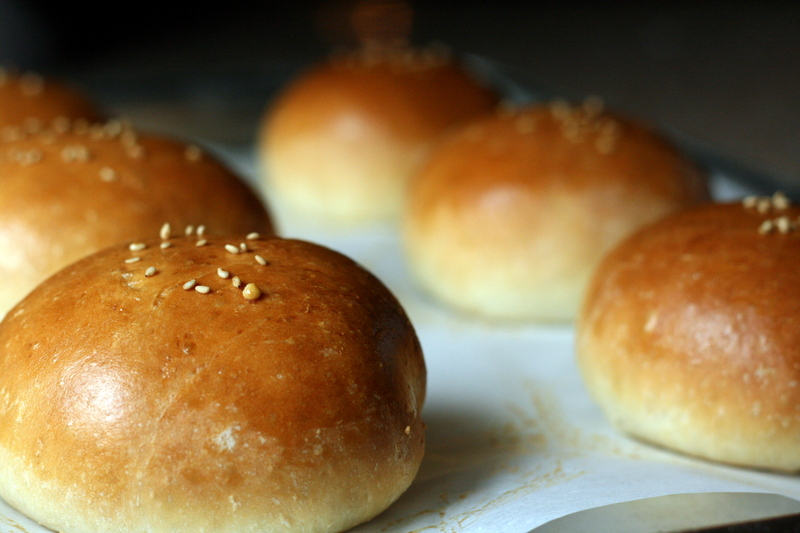 The texture of the buns is partially due to the tangzhong (roux) made from combining flour with water and milk. The tangzhong is incorporated into the dough and the endresult is a bun that’s… well, good. I made this dish for this month’s What’s Baking. The host for August is Ali from Sparks from the Kitchen. She challenged us to bake up something to represent our heritage. I waffled between making dan ta, an egg custard tart, and feng li su, little flaky cakes encasing a pineapple filling. I don’t know how I ended up making neither of those and instead making the char siu bao, but I don’t regret my actions one bit. I loved char siu bao growing up, and I love them still. I hope you enjoy them as much as I do! To make the tangzhong (roux/flour paste), mix together 1/3 cup flour, 2/3 cup water, and 1/3 cup milk in a small saucepan until well combined. Place the pan over medium heat and cook, stirring constantly, until the mixture thickens up and has the consistency of a thick yogurt. The temperature of the roux should not exceed 150°F. Remove the mixture from heat and set aside to cool. In a large mixing bowl, combine 5 cups flour, sugar, salt, and yeast and mix with a wooden spoon to combine. Add the tangzhong/flour paste, 1 cup milk, 2 eggs, and melted butter. Stir together to form a soft dough. Knead by hand for 15 – 20 minutes. If your dough is sticky and not coming together, add the remaining 2/3 cup flour a little at a time until your dough is smooth and elastic. Lightly grease a large bowl. Place dough inside and turn to coat. Cover the bowl lightly with plastic wrap. Place the bowl in a warm, draft-free place and let rise for 60 minutes or until it has doubled in size. Meanwhile, get started on the filling. Heat the oil in a large pan over medium-high heat. Add the shallots and cook for 2 minutes, stirring constantly. Stir in the honey, soy sauce, oyster sauce, sesame oil, and dark soy sauce. Cook until mixture starts to bubble, stirring frequently. Stir in the chicken stock and flour until well combined. Reduce heat to medium-low and cook for 2 – 3 minutes, or until thickened. Remove from heat and stir in the diced roast pork. Set aside to cool. Line baking sheets with parchment paper. Lay the buns seam-side down on the prepared baking sheets and let rise for another hour. Preheat oven to 350°F. Brush the tops of the buns with the egg wash. Sprinkle with sesame seeds and bake in the preheated oven for 25 minutes, or until buns are golden brown. Let cool slightly before eating. Categories: Appetizers & Snacks, Bread, Muffins & Rolls, Main Entrees, Meat, Pork | Tags: appetizer, bread, main entree, meat, pork, snack | Permalink. 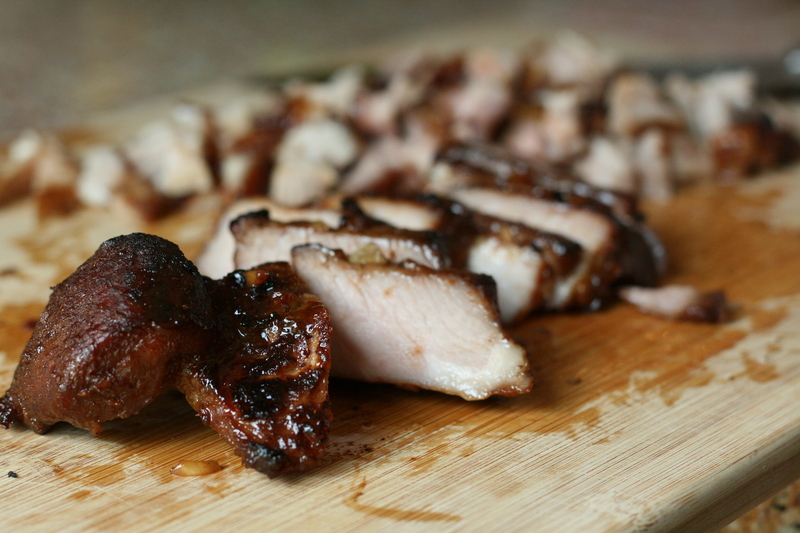 Char siu, or Chinese BBQ roast pork, brings back really fond memories for me. I remember seeing huge slabs of roast pork hanging from windows in restaurants or at grocery stores. I remember stuffing my face full of buns filled with the sweet-salty succulent pork. I can’t even begin to tell you how awesome this pork smelled as it was roasting away in the oven. I might go so far as to say that it beat any cookie, cake, or pie smell that I’ve ever created in my kitchen. Seriously. It was that good. I think I spent the majority of the cook time staring all googly-eyed into the little oven window, watching this pork cook up into what I can only describe as heavenly. If you’re looking for a little happiness in your life, you’re in luck. I’m bringing it to you in the form of some Chinese roast pork. This little piggy… turned out awesome. Stay tuned for part two when this little piggy gets turned into some char siu bao (Chinese roast pork buns). Yeehaw! Cut pork into 3-inch thick strips lengthwise. Place pork into a large zip-top bag and set aside. Combine the remaining ingredients in a medium bowl. Whisk until well combined. Remove 1/2 cup of the marinade into a container. Cover and refrigerate for later use. Pour the remaining marinade into the zip-top bag. Make sure pork is evenly coated with the marinade. Squeeze excess air out of the bag and seal it. Place bag into a baking dish and refrigerate overnight (at least 12 hours). Preheat oven to 375°F. Line a sheet pan with foil and place a metal baking rack on top. Remove pork from marinade, letting excess marinade drip off. Place pork on rack, making sure the pieces don’t touch. Bake the pork for 20 – 25 minutes on each side, or until pork reaches an internal temperature of 145°F. Baste pork with half of the reserved marinade. Move the oven rack to the top third and turn the broiler on. Return the pork to the oven and cook for a few minutes on each side or until the pork is slightly charred. Let the meat rest for 10 minutes before slicing. Categories: Dairy Free, Main Entrees, Meat, Pork, Special Diets | Tags: dairy free, main entree, meat, pork | Permalink. Happy St. Patrick’s Day to you all! If you didn’t get a chance to drink a ton of green beer this weekend, don’t worry – you can still celebrate by whipping up the quick and easy meal of bangers and mash. I found the bangers at Trader Joe’s. If you can’t find any, another type of pork sausage should do. I was blown away by how tasty this was and I kind of regret not buying more of the sausages to freeze for later. 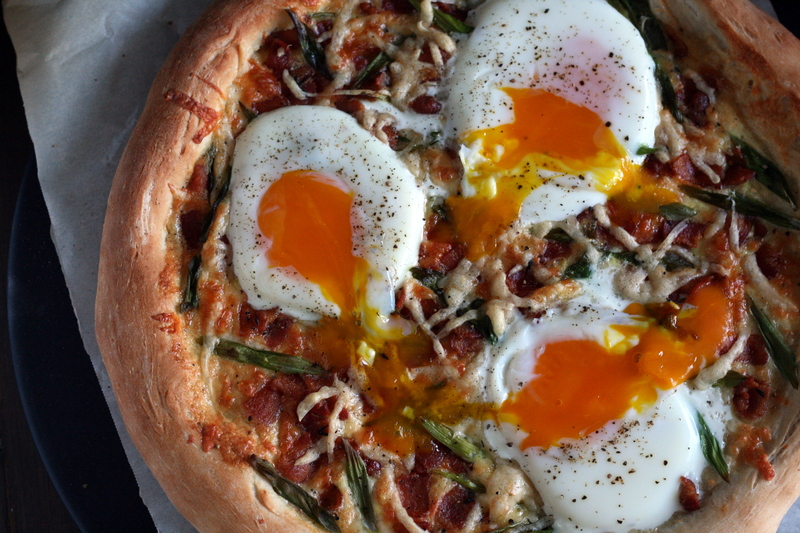 This, folks, is comfort food. 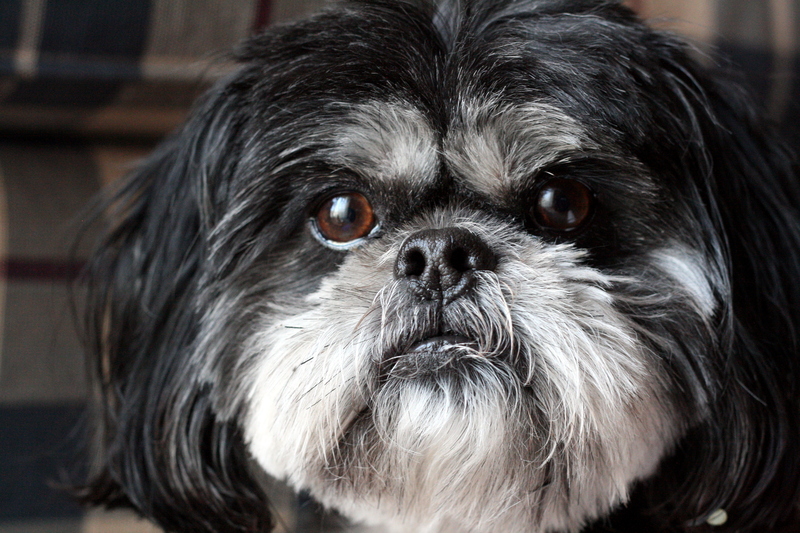 Mr. Ripley was watching me intently as I photographed this meal. He ended up with some mashed potatoes on his ear (see bottom right). Don’t know how, but he did. Weird dog. And, yes, that is a bottle of 3-buck-Chuck in the background. Turns out, we still like to drink like poor college kids. To prepare the bangers: Preheat oven to 350°F. Heat a cast iron skillet over medium high heat and spray with olive oil. Add the bangers and brown on all sides. Add red wine and sprinkle with sage. 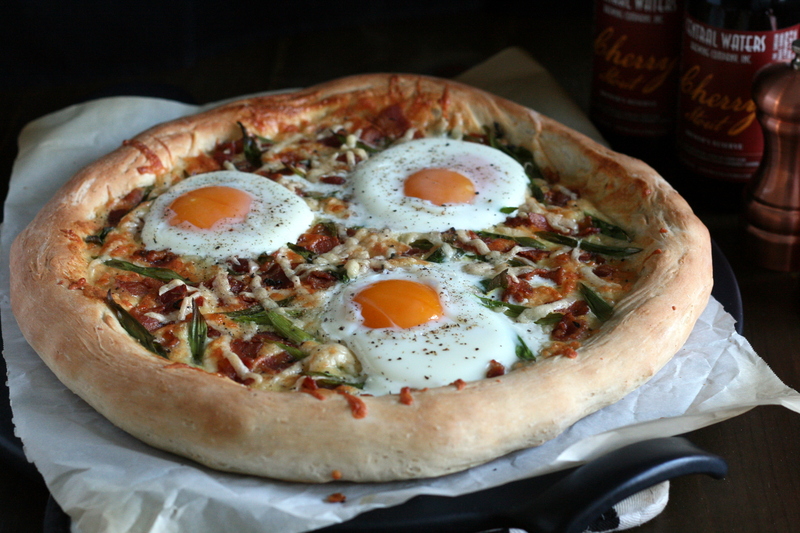 Transfer the skillet to the oven and bake until fully cooked, about 15 – 20 minutes. Meanwhile, prepare the mashed potatoes and gravy. Bring a large pot of water to a boil. Add the potatoes and cook until tender. Drain and return potatoes to the pot. Mash potatoes with butter, milk, salt and pepper. While potatoes are cooking, prepare the gravy. Heat 1 tablespoon olive oil in a large skillet over medium heat. Add onions and cook, stirring occasionally, until onions are very soft and browned, about 20 minutes. Sprinkle onions with flour and stir to coat. Continue to cook, stirring frequently, for 2 minutes. Stir in red wine, broth, and Worcestershire sauce. Allow to cook until reduced to desired thickness. 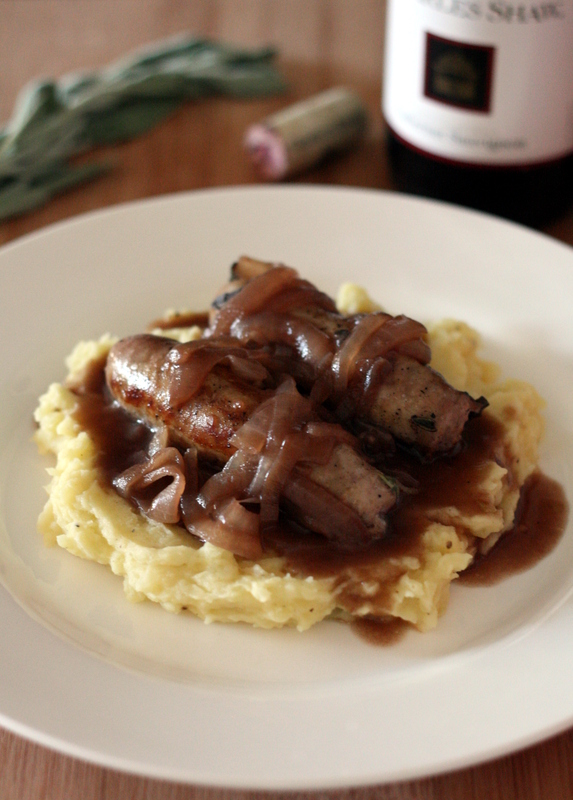 Place the mash on a plate and top with bangers and serve with a generous spoonful of onion gravy. Categories: Dairy Free, Main Entrees, Meat, Pork, Special Diets | Tags: dairy free, main dish, meat, pork | Permalink. I’ve been on the lookout for more interesting pot sticker variations. Yes, pork and chive pot stickers are delicious. As are shrimp pot stickers. Even the vegetarian pot stickers I made a while back are pretty darn tasty. 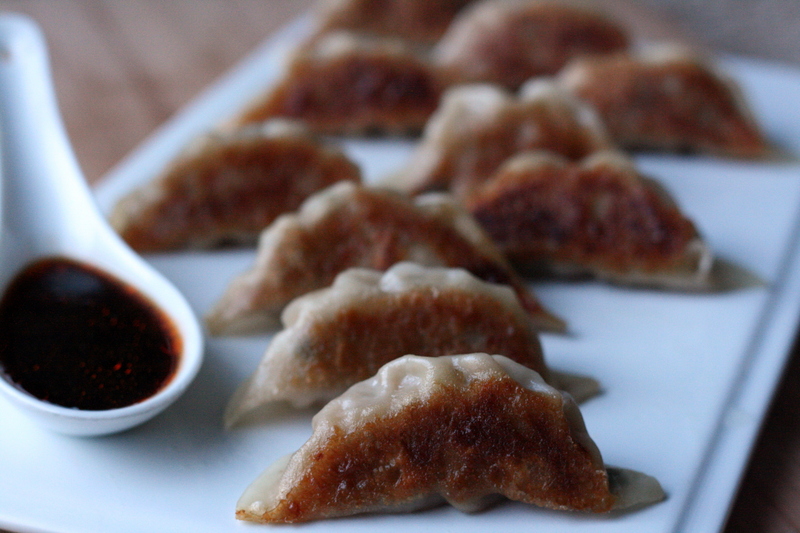 But, these pork and ginger-apple pot stickers take the dumpling game to a whole new level. To make the filling: combine pork and soy sauce in a large bowl. Fold in green onions, chutney, salt, black pepper, and white pepper. Mix until well combined. Set up your station: bowl of filling, stack of pot sticker wrappers, a small bowl filled with water, and a large baking sheet. To cook: heat a large, lidded saute pan over high heat. Add in 1 teaspoon oil and swirl pan to coat. Add pot stickers, pleat-side up, being careful not to overcrowd. Cook until bottoms are browned, about 5 minutes. Add in 1/2 cup water and immediately cover the pan to contain the splatter. 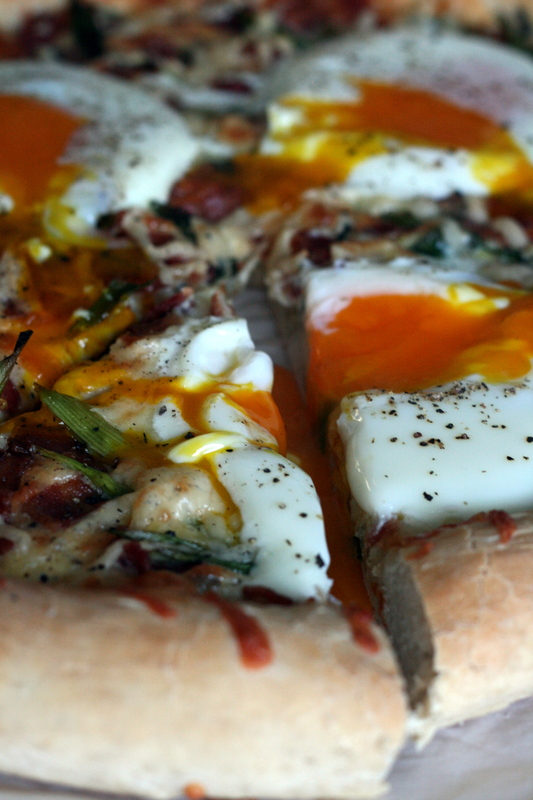 After 30 seconds, when splattering has subsided, slightly crack the lid open to allow steam to escape. Cook for an additional 5 minutes or until heated through and water has evaporated. Let cook for an additional 1 – 2 minutes to allow bottom to re-crisp. Serve immediately with dipping sauce. To make dipping sauce: combine soy sauce, vinegar, sesame oil, and sambal in a bowl and whisk to combine. Categories: Dairy Free, Freezer Meals, Main Entrees, Meat, Money Matters, Pork, Special Diets | Tags: Asian, dairy free, freezer meal, main dish, main entree, pork | Permalink. I don’t know if this is a problem other people have, but every single time I cook for something that calls for chipotles in adobo sauce I am left with two or three lonely chiles. I never know what to do with them and they often go to waste. This time, I planned accordingly. On the first night, I made chipotle quinoa chili. 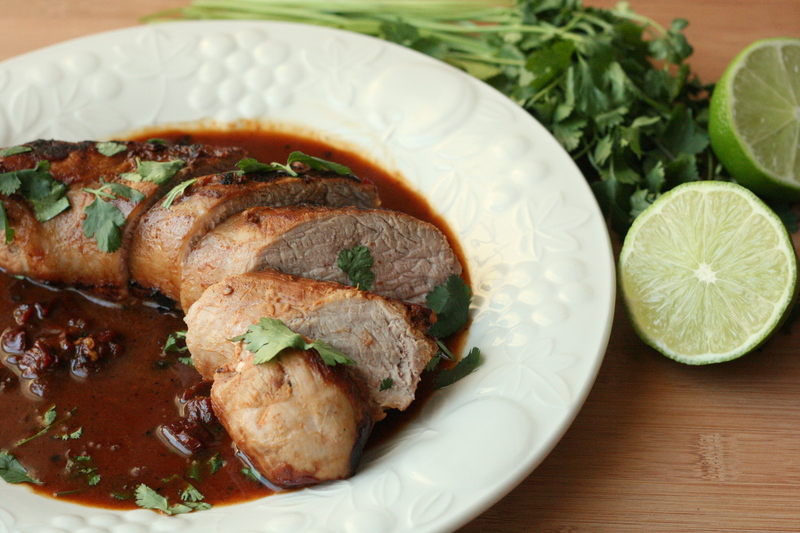 A few nights later, I used up the rest of the chipotle peppers in this delicious pork tenderloin. Place the tenderloin in a shallow container with a lid to marinate. In a medium bowl, whisk together lime juice, lime zest, honey, salt, and garlic powder. Pour half the marinade over the tenderloin; reserving the remaining half of the marinade for the sauce. 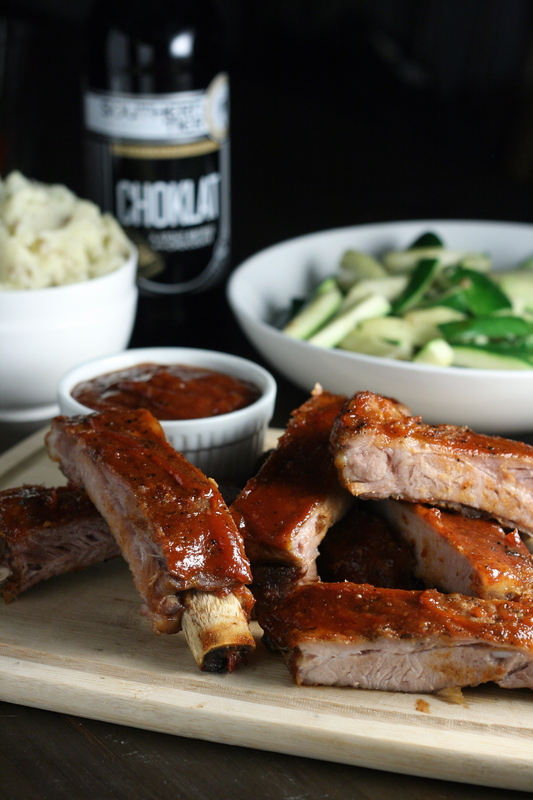 Pour chipotle chiles and adobo sauce over the tenderloin. Cover and allow to marinate overnight in the refrigerator. Remove the tenderloin 30 minutes before cooking. Preheat oven to 450°F. Heat canola oil in a cast iron skillet over medium-high heat. Remove tenderloin from marinade and sear in skillet on all sides, about 3 minutes per side. Place skillet in preheated oven and cook for 15 minutes, turning once halfway through. Once the pork’s internal temperature reaches 140°F, remove from the oven. 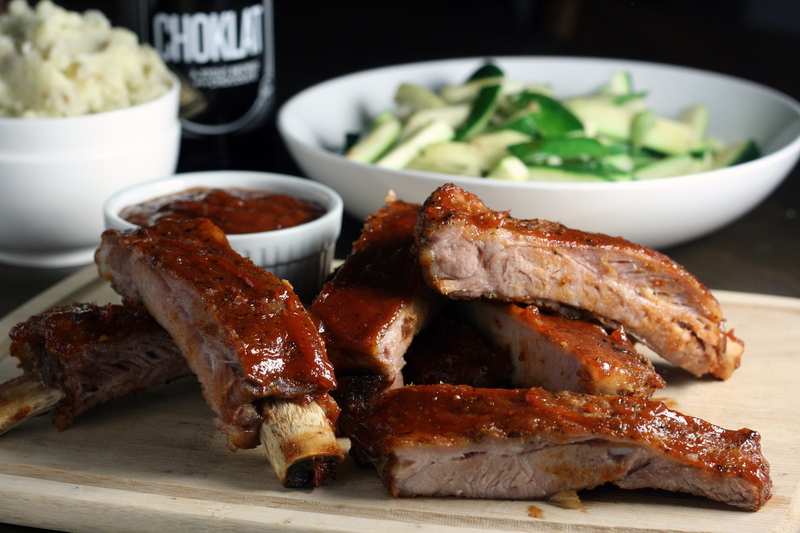 Move pork to a cutting board and cover with foil. Let rest for 10 minutes or until the temperature reaches 150°F. Meanwhile, prepare te sauce: pour reserved lime juice mixture and leftover marinade into the skillet and heat over medium-high heat. Allow sauce to reduce and thicken. Meanwhile, slice pork into 1-inch medallions. Serve sauce over the sliced pork and garnish with cilantro, if desired. Categories: Dairy Free, Gluten Free, Main Entrees, Meat, Pork, Special Diets | Tags: dairy free, gluten free, main dish, meat, pork | Permalink.